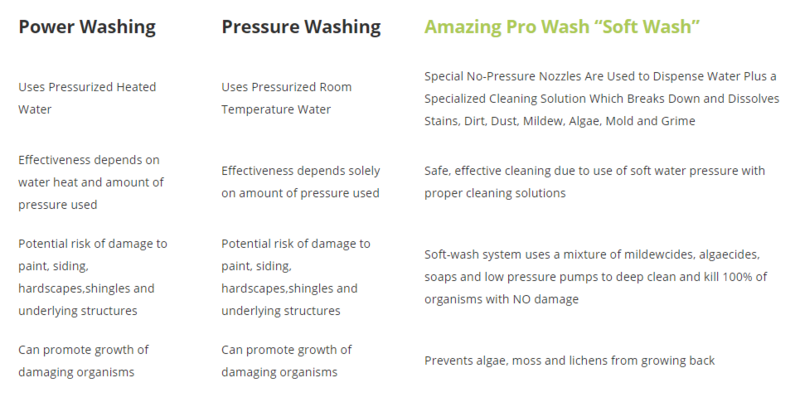 Soft washing uses high volume/low pressure water to deliver the cleaning system. Soft washing provides amazing exterior cleaning results without the use of extremely high pressure that can cause extensive, expensive damage..
Why Should You Use Soft Washing On Your Home? Dirt and grime diminish the appearance of your home. Stained surfaces may harbor bacteria, allergens and pollutants. Stained areas may be slip and fall hazards. Dirty roofs can lead to premature failure of your roof. Power washing can damage your home’s shingles and void your warranty. Soft washing uses low pressure and chemicals to professionally clean your exterior surfaces. NEVER LET ANYONE USE A POWER WASHER TO CLEAN YOUR HOME. for yourself in the chart below.